I thought I’d share chapter one my book, The Decision Checklist: A Practical Guide to Avoiding Problems. We probably make hundreds, if not thousands, of little decisions every day. We make decisions about what to wear in the morning, when to brush our teeth, what to eat for breakfast, whether we’re going to order a grande mocha or a tall soy latte at the Starbucks drive thru, where to park our car, whether or not we’re going to stop and chat with a co-worker in the office. And that’s all before we even sit down at our desk! If you’re a business leader, knowledge worker, or entrepreneur, then decision-making is a major part of your job. As Erik Larson, founder and CEO of Cloverpop, a cloud solution that applies behavioral economics and collaboration to help businesspeople make better decisions, wrote in the Harvard Business Review in 2016, managers make about three billion decisions each year! That’s crazy, right? And, according to Larson, almost all of those decisions can be made better. But now we find ourselves in positions where that decision-making baggage is holding us back. In order to reach our potential as a leader, we need to let go of that baggage and learn better, more effective ways to make decisions. History. Until recently, most managers had relatively little access to accurate information, making it difficult to make good decisions. But even if they had accurate information, that doesn’t mean they would have made good decisions. Economics in the twentieth century was based on the theory that people make rational choices when given good information, but this theory has been proven spotty, and even completely wrong, thanks to a recent revolution in behavioral economics. In addition, the most popular decision-making tool, the pros-and-cons list (popularized by Benjamin Franklin) is nearly 250 years old! Psychology. The fact is, most people are not rational when it comes to making decisions. We use mental shortcuts and cognitive biases that lead to distortions and prevent us from making better choices, behavioral economists have discovered. In addition, we often tend to rely on gut feelings or intuition to make decisions, and when business decisions are made by a group, groupthink takes over, which adds to our individual biases. Technology. While technology and enterprise software have made our lives easier in many ways because some tasks are now automated, the complex and ambiguous information technology offers doesn’t necessarily help managers and their teams overcome challenges to make better decisions. Businesses won’t see dramatic improvements in decision making just by implementing more big data analytics software. So, as you can see, we have our work cut out for us. We have many things working against us in the quest to make better decisions. The first step is understanding these barriers, and understanding how they affect us. As leaders, we live and die by our decisions. We are the result of our decisions, and we all have a vested interest in getting better at making them. Good decisions can get us promoted, and bad ones can get us fired. One cause of poor decisions is that we don’t know what we don’t know. It’s not only that we don’t understand the problem, but we fail to understand ourselves. We lack the knowledge, and the self-knowledge, to approach a decision in a smart way. Do you know HOW and WHY you make decisions the way you do? Do you have the self-knowledge to know when your biases may be getting in the way? Do you really understand the problem? Do you use a consistent process when you make decisions? Do you take full responsibility for your decisions? 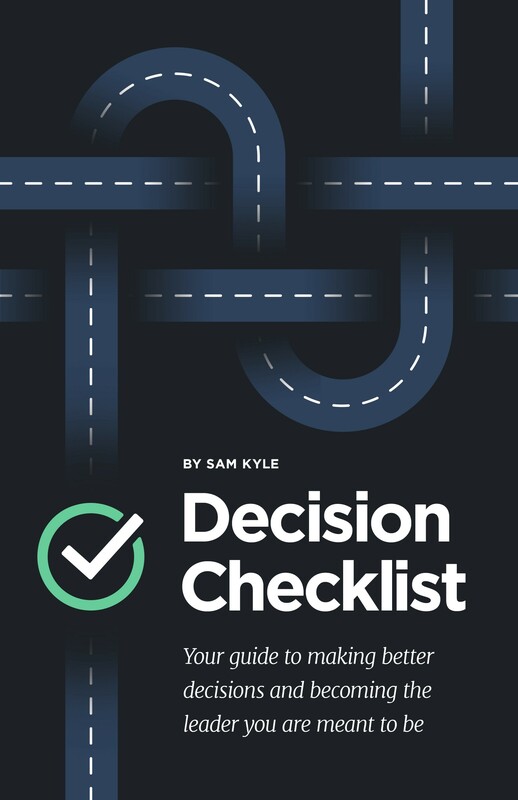 Having an understanding of all these things is integral to making good decisions, and one important thing I want you to take away from this book is the idea that with the right preparation, the right mindset, and the right process, you CAN improve your decisions. But it takes work, some self-reflection, and the right tools. One of the most important tools in improving ourselves is self-reflection. In the context of making better decisions, that means keeping a decision journal. Journaling isn’t just for the brooding teenager. In fact, many accomplished professionals utilize journaling as a daily practice to help them understand and improve themselves. I know a decision journal has helped me change the way I make decisions. It has provided me with a feedback loop, and a mechanism to switch from unconscious to conscious, which is one of the most valuable things you can have. One of the biggest challenges when it comes to improving our ability to make better decisions is learning from our past decisions. This happens for a variety of reasons, two of which we will concern ourselves with. First, our minds tend to rationalize the outcome of our decisions, because it’s hard to admit when we are wrong. It’s hard to go back and see what information we had at the time we made the original decision — because it’s hard to admit the pain of our bad choice. We tell ourselves that bad outcomes are the result of bad luck, and not a bad process. Second, it’s hard to draw cause-and-effect relationships we can learn from, because of the time between the results of our decisions and the decision itself. Rarely do we see that the problems we’re facing today were caused by decisions we made months or years ago. When I first started to use a decision journal, it was clear to me that I had optimism bias. This means I was focusing on the possible positive outcomes while not anticipating and preparing for potential negative ones. Think about your day at work. Maybe you work from nine to five. You drop off the kids at school. It’s a hectic morning. You get into the office a little later than you want. It’s 8:35. You open your email. You have a nine o’clock meeting, but you’ve got to go through thirty emails before then. Before you know it, it’s 8:55, and you only have five minutes to prepare for the meeting, where you’re supposed to make a decision on something. So you pull up the briefing document. You read the executive summary, then go to the meeting. You base your decision on the executive summary, which most times will work. But often that good outcome will lead you astray, because you haven’t done the work behind the scenes to understand the decision, and to understand the dynamics of the problem. Therefore, the result is more attributable to luck, and essentially unrepeatable. It’s counterintuitive, but if you want to make better decisions and increase your productivity, you need to take the time to think about your decisions. I’m always amazed when I see people show up to work and simply react all day to the urgent emails in their inbox. They rely on their wits or snap judgments to make decisions. And, you know, 90 percent of the time that may work, but 10 percent of the time it doesn’t, and that 10 percent of decisions with bad outcomes are going to consume most of your time going forward. A decision journal will help you to slow down, reflect on and understand your decisions, and provide a path for you to get better. In the end, taking the time to think through problems will save you time. Not only will you make better initial decisions, but you’ll spend less time cleaning up the mess of poor ones. I encourage you to use a decision journal throughout this book. In each chapter, you will have a list of exercises that will help you to think about and improve your decisions. We rarely receive feedback on the quality of our choices. There is no Yelp for decision-making ability where we can leave reviews. If you were running a restaurant and customers could never give you feedback, you’d never know that the spaghetti sauce was too bland, or that the steak was too tough. Eventually, customers would stop coming, and you’d go out of business. If we don’t reflect on our decision making, we can’t learn and get better at it. Good decisions don’t ensure success, but bad ones almost always ensure failure. Whenever you’re making a consequential decision . . . just take a moment to think, write down what you expect to happen, why you expect it to happen and then actually, and this is optional, but probably a great idea, is write down how you feel about the situation, both physically and even emotionally. Just, how do you feel? Keeping a decision journal prevents something called hindsight bias, which is when we tend to look back on our decision-making process, and we skew it in a way that makes us look more favorable. A decision journal helps us collect accurate and honest feedback on what we were thinking when we made various decisions. This feedback also helps us see when we were lucky and what we missed. Sometimes things work out for very different reasons than we thought they would. The key to understanding the limits of our knowledge is to check the results of our decisions against what we thought was going to happen and why we thought it was going to happen. That feedback loop is incredibly powerful. Guess what? We don’t know as much as we think we know. We fool ourselves into thinking that we understand something when we really don’t. And what makes it worse is that we often have no means to correct ourselves. Our minds revise history to preserve our view of ourselves. The story we tell ourselves conflates the cause and effect between our decision and the outcome. And the best cure for this problem is the decision journal. A decision journal provides us with quality control. Using the journal is pretty easy, but maintaining it requires discipline and humility. The variables that govern the situation. The complications or complexity as you see it. Alternatives that were seriously considered, and why they were not chosen. A paragraph explaining the range of outcomes you deem possible, with probabilities. Here are some other tips to keep in mind as you implement your decision journal. Get beyond the obvious. Often your first thoughts aren’t your own, but are the thinking of someone else. So try to get beyond the brief and obvious insights. Handwrite in your journal. Technology is great, but writing things down in your own handwriting will keep you honest and help prevent hindsight bias. It’s easy to look at a document on your computer screen and say, “I didn’t see it that way.” It’s a lot harder to look at your own handwriting and say the same thing. Be specific and concrete. Avoid vague language. If you’re stuck in the fog of abstractions, you’re not ready to make a decision, and it will be easy to change definitions to fit any new information. Write down the probabilities as you see them. Review your journal often. I review mine quarterly. This is an important part of the process. It helps you to realize where you made mistakes, how you made them, what types of decisions you’re bad at, etc. If you share your journal with a coach, they can review it and help you identify areas for improvement. Remember it’s not just about outcomes. Maybe you made the right decision (which, in our sense, means used a good process) and still had a bad outcome. That’s called a bad break. On the other hand, maybe you discovered that you had a good outcome for the wrong reasons (i.e., despite a bad process), and a decision journal will stop you from being overly confident in using that process in the future. As you discover more about yourself and your decisions, it may be humbling. But that’s good news, because learning about our weaknesses is the first step in becoming better decision makers.